The Perfect Tortilla is a unique shaped pan that you use to bake tortillas in. Have restaurant style taco bowls in your home and fill them with many delicious foods. Create full meals inside, serve dips, put deserts inside like ice cream sundaes. The easiest way to shape and bake perfect tortillas. Just place the tortilla in the non-stick mold and pop in the oven. In less than five minutes you have created golden, crispy taco bowls. Next comes the real fun part, just put inside all your favorite foods. 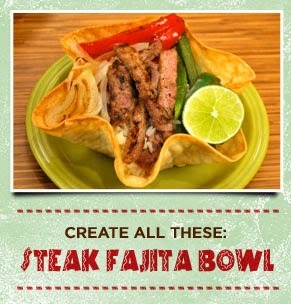 Fill crunchy fajita bowl with chicken, steak, pork, vegetables, rice, and pasta for a sensational treat! Serve up your snacks, main dishes, salads, dips and even desserts. Spice up Birthdays, holidays or have your own Taco Tuesdays! Your party will be a hit with this edible taco bowl. Perfect Tortilla pan’s exclusive design works with all sizes of tortillas that a deep shaped edible bowl. Order The Perfect Tortilla Online Today!